A hectic weekend means Vintage Find Sunday posts a little late, but good finds can be worth the wait! This weekend my Mom and I went to the Rowan County Antique & Yard Sale event in Salisbury, N.C. I picked up great finds, especially since it was the first year for this event. 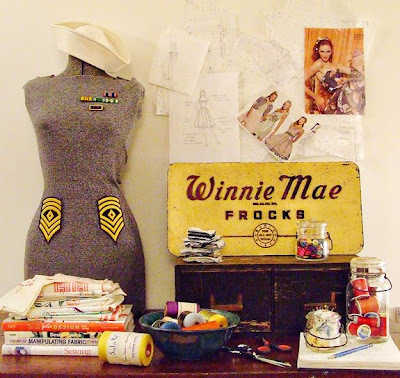 I found the Winnie Mae Frocks sign at the antique event, and decided to go for a fashion design inspired shoot. When I was in school I dabbled in fashion design, and luckily had sketches and patterns to accent the photographs. Every textile designer has their set of needles and pins. 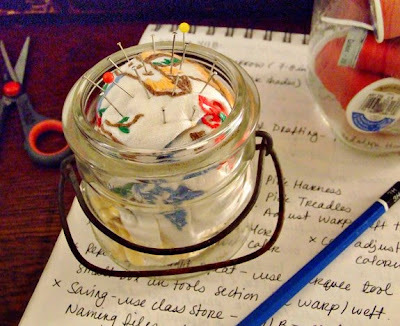 I converted an old jar and vintage fabric into a quick, easy pin cushion. 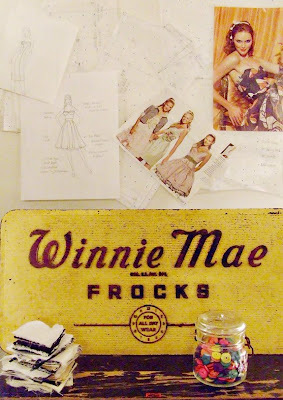 It was love at first sight with this Winnie Mae Frocks sign. The 1930's sign used to hang inside a dress shop. There is an original sticker on the back identifying the USA company that made the sign - all about the details! Above the sign are fashion sketches and patterns from school days...easy way to add inspiration and decoration. My Mom found this wonderful selection of colored yarns from a yard sale last weekend. The colors and original labels are lovely accents in a bowl...this bowl is a hand-made pottery piece from Seagrove, NC. I have been obsessed with military medals after seeing these pillows in a previous post. I was lucky enough to find some this weekend! I pinned them to the body form, and hope to find more to add to the collection. On top of the form (shown in the first picture) is my sister's old Navy hat. 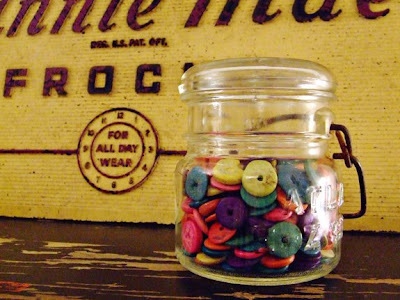 Jars are great for storing all kinds of goods - like these old, colorful buttons. The jar and sign are on a vintage, wooden card catalog. 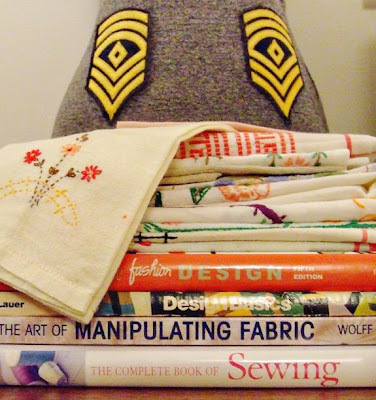 Some fashion and sewing books along with a pile of vintage linens. And the neat military patches in the background! Overall, it was a fun weekend of finds. I have some additional finds to share with you next weekend...very exciting ones I might add! On a side note - as I was photographing the finds I wondered how practical a set-up like this would be in a house. The pieces are not displayed in my apartment like the way I photograph them. But, I feel the ideas can be translated into everyday living. I like the idea of seeing a visual fantasy, and playing dress up with vintage finds. I'm currently going through a transition period of wanting to move and pretend packing, so I hope in the future when I have a permanent apartment or house I can start photographing these items in an everyday setting. For now, I hope you enjoy and gain inspiration. Now if only I can get a better camera! What a great photo shoot! 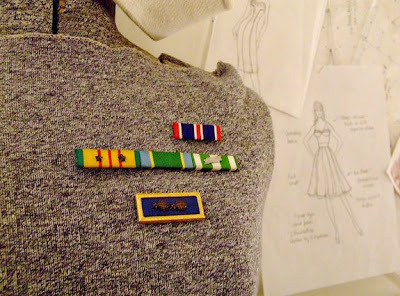 I love the military patches and pins on the dress form. & did you say you have an old card catalogue?! what i wouldn't do for one of those! Those are some awesome finds Diana!! I LOVE that sign too! Great finds! Fun stuff you found! 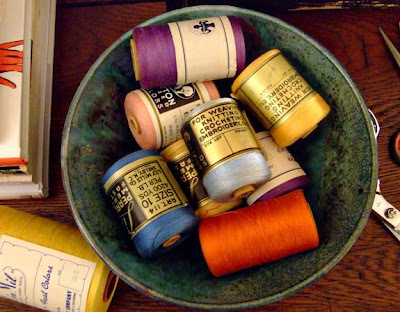 Love all the vintage sewing items. Thanks for the post! I just inherited a vintage body form, and was going to just use it at craft shows this fall, but I'm getting ideas on how else it can be used!